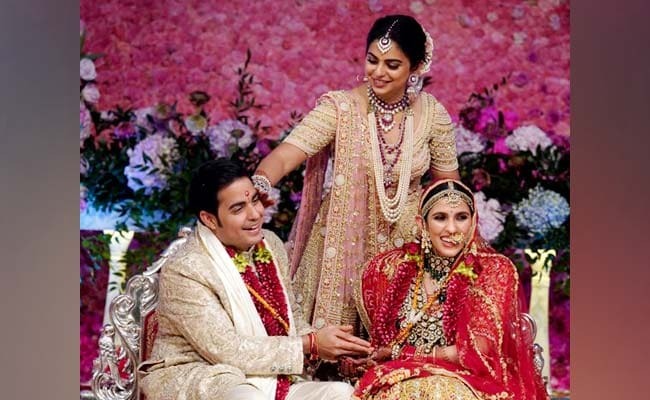 Akash Ambani and Shloka Mehta were married in a glittering wedding ceremony in Mumbai on Saturday, surrounded by celebrities from all over the world. Akash Ambani is the oldest son of India’s richest man Mukesh Ambani and Shloka Mehta is the daughter of diamantaire Russel Mehta. There was huge interest in the wedding, especially after the star-studded display seen at Mukesh Ambani’s daughter Isha’s wedding last year. The wedding took place at the country’s largest corporate house’s newly-constructed convention centre in the Bandra Kurla Complex, a stone’s throw distance away from a school run by the Ambani family, where Akash and Shloka had studied together. A concourse inside the ”Jio World Centre” hosted the baraat (wedding procession), which had Bollywood composers Vishal and Shekhar dishing out foot-tapping numbers. Akash, his mother Nita, Bollywood personalities Shahrukh Khan, Ranbir Kapoor, Congress leader Rajiv Shukla, among others were seen shaking a leg, according to pictures doing the rounds on social media. Other attendees at the wedding included Google Chief Executive Sundar Pichai, veteran industrialists Ratan Tata and N Chandrasekaran, and global chief executives of the Bank of America, Samsung and J P Morgan. Former prime minister HD Deve Gowda, former British PM Tony Blair and his wife Cherie, and former UN secretary general Ban Ki Moon were also present at the wedding, celebrations for which are going to last over three days. Bollywood was represented by Rajinikanth, Aamir Khan, Priyanka Chopra and Aishwarya Rai Bachchan, while the cricket world was represented by Yuvraj Singh, Hardik and Krunal Pandya. The pre-wedding festivities lasted till about 8.15 pm, after which the marriage ceremony began at an exquisitely decorated hall, sources said. An elaborate spread featuring world cuisines has been prepared for the wedding, the second in the Ambani family after the December wedding of daughter Isha to Anand Piramal’s son Anant.